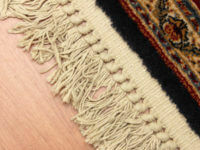 Rug fringe or tassels may appear to be decorative, but they play an important part in holding the pile knots in place. Warp threads, a foundational part of rug anatomy, are what weavers tie off once the rug is complete, creating a more commonly known part of rug anatomy, the fringe. For machine woven rugs, the fringe is sewn or glued on. Rug owners often forget to turn the beater bar off while vacuuming rugs, resulting in fringe damage. Fringe that has been bleached by the rug manufacturer may be weakened, therefore increasingly susceptible to damage. Over the course of time, fringes may shorten as the fibers break off. If fringe damage is severe enough, the rug may literally begin to unravel. Attending to fringe damage before rug damage occurs is highly advisable. Fringe tends to be the dirtiest part of a rug. If you use a brush attachment to vacuum your rug fringe on a regular basis and have your rugs professionally cleaned often enough, the fringe should stay in great shape. However, once there is visible dirt on fringe, that means the particles have become deeply embedded in the fringe fibers. Tassels can be delicate, so removing deeply embedded soil can be difficult and is best left to rug cleaning professionals. Rug owners often damage fringe using overly aggressive DIY solutions and methods in an attempt to remove soil and restore the former appearance of the fringe. Professional rug cleaners can achieve fantastic results cleaning rug fringe, unless the fringe is damaged. If tassels are brittle and easy to break off, even the most careful and gentle cleaning methods will not only fail to restore their former appearance, but will also likely result in further fringe damage. Sometimes frustrated rug owners cut or hide their rug fringe. While a little tassel trimming may help, excessive trimming can lead to knots unraveling. Rug owners who want to hide tassels should have this work done by a rug repair professional instead of using carpet tape, because the adhesive residue can damage the fringe once the tape is removed. Not all professional rug cleaning companies have the knowledge or experience to assess fringe damage and safely clean rug fringe. Be sure to carefully select a reputable rug cleaning company with a long track record of successfully cleaning rug fringe. If you have any questions about rug fringe care, feel free to contact us.